History Today has a new corner on it site, dedicated to various historical exhibitions. Tory Historian is making lists of those that must be seen as soon as possible. Yesterday was the anniversary of both Charles II's birth and, more importantly, his astonishingly peacerful entry into London in 1660 at the start of his own long and rather controversial reign. Well, it has attracted a great deal of controversy then and since. Through London Historians Tory Historian can link to an excellent article on the subject by Tom Sykes. Francesco Giavarina [Venetian Ambassador to England] was not alone in waking up on the 30th May with a hangover and the creeping realisation that someone would have to pay for the party. On Tuesday 29 May 1660, his thirtieth birthday, Charles Stuart returned to London for the first time since he left as a boy at the start of his father’s long and bloody civil war. He rode into a city which a decade previously had looked on unblinking as Parliament severed his father’s head from his body and the nation from its monarchy. He had attempted to return before, but many plans and plots came to nothing. Even his invasion at the head of a Scottish army had failed. It had taken the death of Oliver Cromwell two years earlier, the crumbling of Parliamentary authority, and a distinct lack of options for his time to come. And as every schoolchild used to know, he was determined never to go on his wanderings again, if it meand accepting a pension from the King of France. Tory Historian maintains that most of the best writers and playwrights are conservative in their outlook. So the news that David Mamet the best present-day American playwright has moved from left to right did not come as a surprise - the man is talented, after all - but was very good to hear anyway. With all the talk of Hollywood liberalism — the endless leftist blather from Sean Penn and Tim Robbins, the cozying up to Castro and Chavez by Oliver Stone and Danny Glover, the jejune Iranian peace-making by Annette Bening and Alfre Woodard, etc., etc — it’s fascinating that the two leading playwrights in the English language (the smart guys) — Tom Stoppard and David Mamet — identify as conservative/libertarians. And why not? After all, Shakespeare was deeply conservative in his outlook and much afraid of political change for the sake of it. It is a curious feature of this blog that the most likely postings that other blogs might link to are those about detective stories. One posting about the clerical mysteries of D. M. Greenwood has elicited at least two links from widely differing blogs. One from the very fine Clerical Detectives and another from the slightly more dulalee Mystery Mile, whose author a soi-disant atheist who is fascinated by theology, socialist and anarchist (which two are incompatible) shows some lack of understanding of conservative thinking. Still, his own writing is interesting and a link is a link is a link. It would be good to think that people have also linked to the posting about Sir Arthur Conan Doyle and his creations but, so far, no evidence of that has surfaced. We return to that subject after the sad news of the death of Edward Hardwicke, one of the best Dr Watsons to the best Holmes, played by Jeremy Brett. The Watson of the stories is steady, decent, intelligent though not a genius, courageous, a successful doctor, a man anyone would want to have around and one whom Holmes appreciates though when in a bad mood he does make derogatory comments. Holmes's appreciation of his friend and colleague is not the affectionate sarcasm of Poirot towards his genuinely stupid friend, Captain Arthur Hastings. Where on earth did the myth of the stupid, bumbling Watson come from? Partly, one suspects, it is the influence of Agatha Christie's Hastings; partly it is the fault of Nigel Bruce in those execrable films with Basil Rathbone (such as The Hound of the Baskervilles). All that began to change with Nigel Stock, in TH's opinion the best Watson, played to both Douglas Wilmer and Peter Cushing (an excellent Holmes). 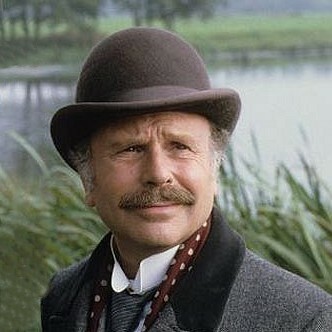 Jeremy Brett had two Watsons, David Burke and Edward Hardwicke who restored the original character of the sturdy, steady, perfectly presentable Watson. The most interesting interpretation was Michael Williams's on radio with Clive Merrison. Tory Historian possesses tapes of several episodes and enjoys listening to them. There seems to have been a clear decision made by the producers to make Watson's role bigger and more important - in a number of episodes he is an almost equal partner. A long way from Nigel Bruce's genuinely bumbling idiot but not too far from Edward Hardwicke's interpretation. Tory Historian seems to have overcome problems with Blogger but considers modern technology to be somewhat less than it is cracked up to be. In the meantime, History Today's June issue has come out and it has an excellent "contrarian" article by Tim Stanley on the subject of apologies for historic events and actions. Not a good idea, opines Mr Stanley, as it over-simplifies historic events (dumbs history down, would be TH's comment) and he proves it by giving a brief account of the different aspects of the Mau-Mau rebellion and the British suppression of it. 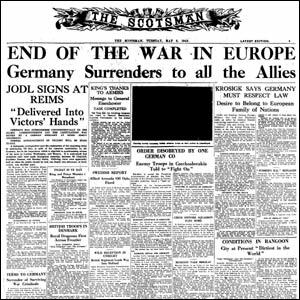 Blogger seems to be playing up in different ways at the moment, which makes it impossible for Tory Historian to post. We all hope the problems will be solved. 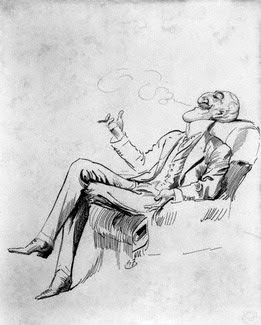 Tory Historian had long intended to read Max Pemberton's Jewel Mysteries I Have Known, as it contained the splendid Ripening Rubies, a tale first disinterred by Sir Hugh Greene in The Rivals of Sherlock Holmes. As this blog describes, the collection, the TV plays made from the stories and the particular tale of dastardly deeds in upper class London are a joy. TH did not manage to purchase the volume referred to but borrowed it from London Library. It does, indeed, give tactile pleasure to anyone who reads it. The illustrations are delightful. As ever, TH decided to find out more about the author and came face to face with another terrifyingly busy and successful man of letters, journalist and editor. Indeed, he was even knighted for his various achievements. There are several portraits in the National Portrait Gallery - a sure sign of achievement. The cartoon above is the most attractive. Tory Historian was reminded today by Radio 3 (one can still listen to that from time to time) that today is the anniversary of the very first performance of Beethoven's Ninth Symphony. The Ninth Symphony was premiered on May 7, 1824 in the Kärntnertortheater in Vienna, along with the Consecration of the House Overture and the first three parts of the Missa Solemnis. This was the composer's first on-stage appearance in 12 years; the hall was packed. The soprano and alto parts were interpreted by two famous young singers: Henriette Sontag and Caroline Unger. Concert goers had more stamina in those days. Accounts of the performance differ but they all seem to involve Beethoven's presence on the stage, though he could no longer conduct, having gone deaf, and the need to turn him round to see rather than hear the audience's reaction, though whether the great applause came after the Scherzo of the last movement or after the whole of the performance remains doubtful. It is always a pleasure to see a gorgeous building that could have been demolished but for the wise intervention of the great Sir John Betjeman renovated and re-opened. The former Midlands Hotel, now St Pancras Renaissance Hotel is a joy to behold. Tory Historian has spent a great deal of time watching its gradual emergence from what was more little more than rubble within a fine frame and will be visiting it very soon. In the meantime, here is Mark Easton's glowing account. 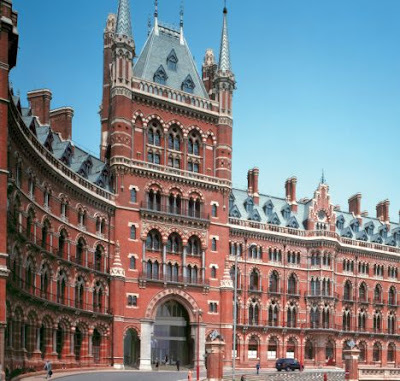 The ghost of Sir John Betjeman will be grinning from ear to ear tonight as it hovers among the guests at the grand opening of the St Pancras Renaissance Hotel in North London. Not only does the event mark the climax of a project to rescue and resurrect a building the poet personally sought to protect from the bulldozer barbarians of the sixties, it also glorifies an extraordinary monument to the skills of the ordinary English working man. And what could be greater praise? Tory Historian has been reading three different books at different rates. Firstly a collection of Victorian detective stories, edited by Michael Cox, consisting of some very well known works, some not so well known and some quite obscure, which is always a joy to find. Even the least well known and the weakest of the writers (not always the same thing) display an ability to manipulate style that is seen only among the best nowadays. And, as ever, it is astonishing how many of the stories are not about murder but fraud or robbery, all too often of jewels but sometimes of money, which comes in both paper and gold. Then there is Philip Guedalla's collection of literary essays, A Gallery, found, like the previous book in one of the remaining second hand bookshops in Charing Cross Road. 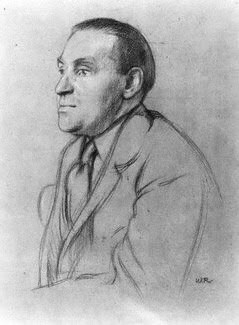 Guedalla, a politician (though not terribly successful), barrister, well thought-of historian and man of letters is someone whom it is hard to imagine these days. Possibly John Julius Norwich comes close though he is not a barrister or a politician. Tory Historian possesses a slightly battered copy of If It Had Happened Otherwise, a book of counterfactuals, published in 1931, in which the best essay is undoubtedly by Mr Guedalla who envisages European history after a Moorish victory at Granada. Diana had always understood the need for visibility - the need to be seen to be doing what you were doing. Even though she died before the celebrity age took proper hold, it was obvious that she had a well-developed instinct for the headline or the arresting photograph. There can be nobody left in the country who does not know of the attention she paid to Aids sufferers or the victims of landmines. Her friendship with fashion and showbiz stars epitomized by the image of her comforting Elton John at the funeral of the fashion designer Gianni Versace, added to her lustre as a sort of international celebrity. In this kind of atmosphere, those who went about their duties without the aid of stardust simply could not compete. The hundreds of public engagements carried out by Princess Anne every year, and her decades of work for theSave the Children Fund, now go largely unremarked and uncovered by the media. Even the Prince's Truyst - which, since it was first established by Prince Charles, has gone on to become one of the most important and successful public endeavours of its kind ever to be initiated by a member of the royal family - has still not been accorded the recognition it is due. Yet, whose work will survive longer?